Mario standing next to the Headless Snowman's head. The Headless Snowman is a minor snowman character who appears in Cool, Cool Mountain of Super Mario 64 and Super Mario 64 DS, and is the focus of the mission Snowman's Lost His Head. His head resides on a pedestal around the halfway mark of the mountain, while his body (a snowball that also has a mind of its own) appears on a pedestal near the start of the level during that mission. 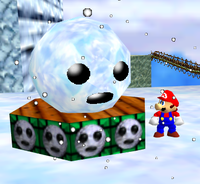 Mario (or Yoshi, Luigi, or Wario in Super Mario 64 DS) can assist the snowman head (who is looking for nearby headhunters) by rolling down the snowball fit to be the Headless Snowman's new body. However, running into him will cost the player two health points. If the player isn't by the head when the body starts rolling towards it, it will miss the head entirely and fall off the stage, and the player must restart the stage from this point for the Power Star. If Mario is by the snowman's head, the body will run into the head and complete the snowman itself. If this happens, the snowman gratefully awards him with a Power Star. Headless Snowman seen with a full body in Super Mario 64 DS. 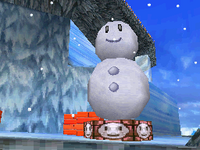 The Headless Snowman reappears in Super Mario 64 DS, with the same role as the original game. In this appearance, he is given facial expressions. Without the rest of his body, he gets a sad face but when he gets his body back, he gets a smile. He also appears in the minigame Snowball Slalom, in that same game and in the New Super Mario Bros. version of that game. Once this mission is complete, the snowman will remain with a full body in one spot during every mission (unless the player does Snowman's Lost His Head again). Also, if the player finishes the game without completing the mission, his head won't be there in the ending. Although the Headless Snowman is a minor character in his few appearances, he got some publicity in the form of a Nintendo Power joke published around the time of the main circulation of the "L is Real 2401" Super Mario 64 rumors. In Volume 107 of Nintendo Power, a "Luigi 64" article is present where Nintendo states that Luigi fans had been campaigning to have the character in his very own game, and their response was to create a hoax upcoming game known as Headless Snowman 64. This game was apparently to be made to satisfy fans of the "second bananas" by featuring a cast of both well-known and obscure characters (that weren't Luigi), from Samus Aran to "random audience members from Super Punch-Out!!" to the Headless Snowman himself. Additionally, the game would supposedly contain some non-Nintendo characters such as "one of the civilian women in GoldenEye 007" (in the mistaken belief that her name is Luigi), "that bald guy from Blast Corps" and "the bikini woman in Cruis'n USA". Humorously, this never-made game wasn't going to feature Luigi. This page was last edited on February 15, 2018, at 13:51.